Last month, rebels in the Central African Republic launched a sudden military campaign against the government, rapidly taking over city after city in their advance towards the capital. Fighting has now come to a temporary halt, with much of the country under rebel control. Read on for a summary of the conflict so far. In 2007, a three-year civil war came to an end in the Central African Republic (CAR) when the government reached a peace agreement with several rebel groups. Yet six years later, some of the rebels feel that the government has still not honored its side of that agreement, and last month violence broke out once again. The new fighting was initiated by a coalition of rebel groups calling itself "Séléka", which means "alliance" in Sango, the national language of the CAR. The rebels have threatened to depose President François Bozizé, who took power in a 2003 coup but has since won two controversial elections. The rebel campaign began on December 10, when they took over N'Délé, a regional capital in the country's north, which had been under the control of a government-allied former rebel group. At the same time, the new rebel coalition captured two other northern towns, Ouadda and Sam Ouandja. A week later, they stormed into Bria, a diamond-mining town and regional capital in the country's east. By this time, their forces in N'Délé had also advanced south to capture the town of Bamingui. Despite the Central African government receiving reinforcements from its ally and neighbor Chad, the Séléka rebels continued on the road to Bangui, taking the towns of Kabo and Batangafo in the next two days after the Bria attack (despite some sources indicating towns being retaken, government forces no longer seem to be in control of these places; however, rebel forces may not maintain a strong presence either). In the following days, Séléka's forces moved west from Bria, seizing the town of Ippy on the way to Bambari. The latter city, among the country's largest, fell to the rebels on December 23. 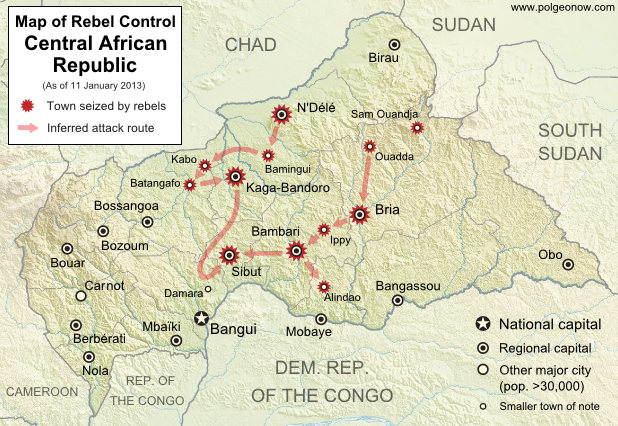 Central African government forces subsequently attempted to retake Bambari, but were held them back. Two days later, Séléka forces in the north captured another regional capital, Kaga-Bandoro, after only brief resistance. The seizure of Bambari and Kaga-Bandoro paved the way for Séléka to advance on Sibut, the last regional capital on the road to Bangui. It was soon reported that the rebels had bypassed Sibut to avoid Chadian forces stationed there, and had instead proceeded to the next major town, Damara. However, a few days later rebel forces seized Sibut, and it became apparent that Damara was in fact still government-held, with Central African and Chadian troops having pulled back to there from Sibut. The rebels are now using Sibut as their forward base, while forces from neighboring countries are amassing in Damara as a firewall against any invasion of the national capital, Bangui. A contingent has also arrived from more distant South Africa. Aside from the rebel capture of Alindao (and possibly one other small town) near Bambari, fighting has come to a standstill since the end of December. A temporary ceasefire was finally reached on Thursday between the Central African Republic government and Séléka, with word of a possible unity government in the near future if talks proceed smoothly. Political Geography Now will be watching the situation closely, and reporting promptly on any new territorial developments.